Bring presentations to life with impressive brightness, flexible integration and powerful picture features. The VPL-FW60 installation projector is ideal for a wide range of business, education and entertainment applications. The energy-efficient High Pressure Mercury (HPM) lamp source is teamed with Sony's advanced BrightEra 3LCD projection engine to deliver extremely bright, crisp WXGA resolution images with powerful 5200 lumens maximum light output and rich, stable colours. Reality Creation and Contrast Enhancer technologies fine-tune image quality even further to assure exceptional clarity and realism with every presentation. Offering a stylish blend-in design, tidy cable management and low fan noise, the VPL-FW60 fits smoothly into almost any environment – from academic institutions, corporate, medical training and public sector organisations to visitor attractions and retail spaces. Seamlessly blend images from multiple projectors to create super-sized displays, or project accurately proportioned images onto angled or curved surfaces. Mount the projector at any angle, even on its side or upside down. Set-up is easy with a friendly installation menu. The energy-efficient High Pressure Mercury (HPM) lamp source is coupled with Sony's acclaimed BrightEra 3LCD projection engine to ensure high 5200 lumen image brightness with vivid, natural colour reproduction. Picture quality is boosted by advanced processing featured on Sony home cinema projectors. Reality Creation uses a powerful pattern-matching database to optimise every pixel. Contrast Enhancer actively analyses and refines dark and light image areas for sparkling highlights and rich, deep blacks. View PC presentations or videos with WXGA (1280 x 800) 16:10 resolution. Focus on great-looking images instead of arduous maintenance tasks: automated filter cleaning system removes dust every 100 hours. 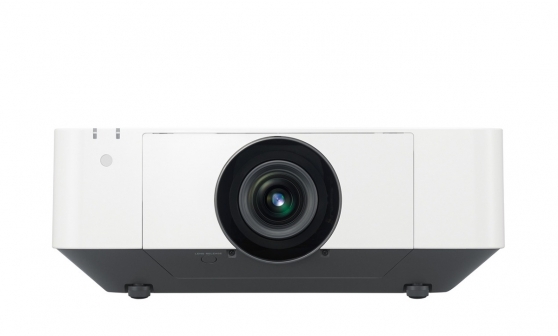 Generous lens shift adjustments give more flexibility for positioning the projector where you need it: close to ceilings or even horizontally offset. Installation flexibility is increased by a wide range of compatible lens options to suit virtually any size of room and throw requirements. Quick-release bayonet mount simplifies quick lens exchange. Simpler, more cost-effective installation and connectivity with digital transmission of HD video, audio and networking/control over a single Ethernet cable. Seamlessly join accurately colour-matched images from multiple projectors, simplifying creation of stunning super-size displays for corporate and education. Easily correct image geometry for natural-looking projections – even on convex or concave surfaces. Corner and edge correction can be easily adjusted with the supplied remote and on-screen menu. Low fan noise ensures discreet, unobtrusive operation in quiet environments from museums and galleries to lecture theatres. The slim, stylish case design features a flat top surface that blends in discreetly when the projector is ceiling mounted. The clean appearance is accentuated by a terminal cover that reduces cable clutter. Picture Mode ensures great-looking presentations in a wide range of operating conditions. Select Standard, Dynamic, Brightness Priority or Multi Screen mode for optimised image quality, with any source and in every room. Easily adjust projector settings with remote commander, including image warping and edge blending. Project images from two inputs at the same time: ideal for applications such as video conferencing and medical training where two images need to be seen simultaneously. This figure is expected maintenance time, not guaranteed time. The actual value depends on the environment and how the projector is used. Available for VESA Reduced Blanking signal. Lamp in this product contains mercury. Disposal of these materials may be regulated due to environmental considerations. For disposal or recycling information, please contact your local authorities or see www.sony.com/mercury for additional information.